Last week, I posted an article on The John Willis Family of Dorchester and Caroline Counties, Maryland. Born about 1660, John Willis migrated from England as a young man. He was a small time farmer and served as Court Crier at the Dorchester County Court. He patented land in 1702 and named it “Wantage” after his hometown village in Berkshire County, England. John had children Grace, John, Eliza, Andrew, Thomas and William. John, Sr. died in 1712 leaving a will naming four of his six children, two of whom had proved descendants. My intent is to write additional articles regarding these descendants of Willis’s sons John, Jr. and Andrew. However, before undertaking that task, it would be useful to share some research that helped identify the patriarch John Willis in the original article. Several Willis families on the Eastern Shore include persons named John. Numerous primary records, such as headrights, land patents, deeds and wills record other individuals who may be connected to John Willis. Other secondary sources contain the work product of professional researchers. For example, the twenty-three-volume Colonial Families of the Eastern Shore of Maryland recognizes four Willis families. However, none is the John Willis Family of Dorchester and Caroline Counties. One monograph, “A Documentary History of One Branch of the Willis Family of the State of Maryland, c.1680–c.1802,” does address the correct family but contains several errors as to John’s origin and his descendants. Indeed, my data table for accumulated research from sources related to Dorchester County is 110 pages long. This article summarizes evidence from some of those sources and my use of each in my search for the correct John Willis. Colonial Families provides an entry for “The Willis Family of Dorchester County.” This is a Quaker family headed by a Richard Willis who married Frances, widow of Richard Dawson. Richard Willis patented 260 acres called Rondley in 1687. Richard’s 1689 will naming children Richard, John and Frances included a reference to Rondley. This tract distinguishes Richard’s family from the subject John Willis of Dorchester and Caroline Counties. The land related to Richard is located on the Transquakin River and on the Nanticoke River many miles from Wantage where the John Willis family lived near the county seat of Cambridge. While this Richard Willis clan is not the family in question, several people incorrectly attributed to the Richard group by Colonial Families are members of the John Willis Family. Specifically, Colonial Families names a John Willis, with sons William and Andrew, as a “probable” son of the senior Richard Willis. This John is not a son of Richard but is an original immigrant and the patriarch of the John Willis Family of Dorchester and Caroline Counties. William and Andrew were indeed sons of John of Dorchester and members of that distinct family group based on deed records related to Wantage and John’s will and its probate. Furthermore, they were not Quakers. Rather, a Quaker John Willis who married a Margaret Cox at the Transquakin Meeting House in 1712 is a more likely descendant of this Richard Willis. “The James Willis Family” in Colonial Families begins in Somerset County in 1679 when James marries Rebecca Barnaby, daughter of James Barnaby. A James Willis is named in the early patent books as having been transported to Maryland by 1665; James Barnaby and wife Mary with their two daughters Rebecca and Elizabeth were also named as transported to the Province in about the same time. Other records show James Barnaby first patented land in 1663 thereby preceding James Willis to Maryland. I found no connection between this family and John Willis of Dorchester and Caroline Counties. “The Nathaniel Willis Family” established itself in Worcester County in the 1730’s according to Colonial Families. Nathaniel’s family arrived too late to have been connected directly to John Willis of Dorchester and Caroline Counties. An earlier record in Worcester County shows that a Thomas Willis patented land called Amity north of the Pocomoke River in 1683, but Thomas left no male heirs ruling out any ancestral connection to John Willis. 4. The will of the son John Willis, a cordwinder of Kent County, proved in 1716, leaves everything to his brother Richard, naming William Hopkins as executor and noting that his brother Richard will be under the care of William Hopkins until of age. Richard, born in 1697, was almost 19 when his brother died. Thus, it is clear that the Willis Family of Kent County with brothers John and Richard was a Quaker family originally headed by John Williss, and that it actually had its beginnings in Cecil County. Clearly, this is not the non-Quaker family of John Willis of Dorchester and Caroline Counties. In conclusion, Colonial Families does include the correct John Willis although attributed to the wrong family. In fact, none of the clans summarized in Colonial Families is the right one. The frequent use of the given names John, Richard, William and Thomas within the various Willis families during the 17th and 18th centuries complicates the task of distinguishing people of the same name and associating them with the right clan. This so-called “same name confusion” affects not only our modern day analysis but created confusion 300 years ago. A case in point is the probate of the will of the previously mentioned John Williss of Cecil County. According to Perogative Court records, following the death of John Williss the court lost track of John’s widow and executrix Dorothy. She had filed an account in her deceased husband’s probate in 1700 from Cecil County, but in 1702 the court twice ordered the Sheriff of a different county — Dorchester — to bring the widow to court presumably to file additional inventories and accounts. The sheriff responded in both instances that she could not be found in his jurisdiction. She and her new husband William Hopkins finally filed the necessary documentation six years later from their residence in a third county — Kent. We can infer that the reason the court looked for Dorothy in Dorchester was first the court knew she had left Cecil County. Secondly, the court knew from other filings that a John Willis and a Richard Willis lived in Dorchester. Since both those names appeared in the will of John Williss of Cecil County, the court may have thought the Dorchester residents to be those heirs and assumed Dorothy may be close by. In fact, there is no established relationship of the Richard and John Willis residing in Dorchester County to the John of Cecil County. The two men known by the court to be in Dorchester at that time may have been Richard the county coroner and John the county court crier. We just do not know. It is, however, now clear from the record in 1708 that Dorothy, her new husband and her two sons, John and Richard, were in Kent County and not in Dorchester. “A Documentary History of One Branch of the Willis Family of the State of Maryland, c.1680-c.1805” lists many deeds, wills and other records that summarize the John Willis family’s official existence. It correctly identifies the John Willis who became patriarch of a new Willis line of immigrants, but suffers from a bit of “same name confusion” as to his origin. The monograph asserts that John Willis first owned land in Barbados and then moved to St. Michaels, Maryland, in 1680, rather than coming to the Province directly from England. The article does not cite a source for this statement. Nor does it explain John’s relocation to Dorchester County from St. Michaels in what is now Talbot County. I doubt that John of Barbados ever went to Maryland based on several pieces of evidence. First, the records in Barbados (St. Michaels Parish, interestingly) indicate that John Willis had a hired servant and owned five slaves and five acres of land. With only five acres of land, this man does not sound like a farmer. Instead, he sounds like a merchant of some sort and rather wealthy, not like John Willis of Dorchester and Caroline. Second, if the wealthy John of Barbados had arrived in Maryland in 1680, he likely would have purchased land far earlier than the 1702 patent of Wantage. There is no record of such a purchase in either Talbot or Dorchester Counties. Logic says that John of Dorchester and Caroline counties came directly from England and not Barbados. Regardless, “One Branch” creates a workable outline for the correct John Willis family. There are several Willises who appear in the earliest Maryland patent records related to land granted under the headrights program. Under that program, in effect between 1633 and 1683, persons paying passage to the colony for themselves or others were entitled to 50 acres of land for each person transported. Sometimes, the transported person paid back the cost of his or her passage by service to the benefactor, in which case the passenger became entitled to a headright of his or her own. The patent books also show early headrights claimed for the transportation of a Francis Willis by 1649, Edward Willis by 1657, James Willis by 1665, and again a Thomas Willis by 1666. A John Willis is also listed as having one headright by 1666. He may have transported himself, bought a headright, or he may have been transported by someone else and completed his term of service earning a headright of his own. Regardless of how John obtained the headright, there is no indication where he located within the Province of Maryland and nothing to connect him to the Eastern Shore. Importantly, no land records indicate that a John Willis took possession of headright acreage in Dorchester County at that early date. Finally, there is a Henry Willis transported to Maryland in August 1684 at age 21 on the John & Elizabeth bound to John Moore of London for four years. Henry Willis was from Wantage. The ship’s record names Henry’s father as Leonard Willis. It is possible that Henry Willis was related to John Willis of Dorchester and Caroline Counties although I have not proven any connection at this point. A John Willis does first appear in the records of Dorchester in 1680 as witness to two land transactions involving Thomas Foulks. I find no corroborating evidence that this John is connected to the subject family. Such evidence might be, for example, subsequent involvement of the named parties in the deed record with the members of the John Willis Family of Dorchester and Caroline Counties. There is no such involvement except, possibly, with a Thomas Jones who is another witness in one of the transactions. A son of our subject John Willis marries the daughter of a neighbor named William Jones, and this William Jones becomes a witness to and executor of John Willis’s 1712 will. If William Jones and Thomas Jones are related, it might support a theory that the 1680 witness John Willis is the head of the subject family. However, I have not found a relationship between the two Joneses. To the contrary, the name Thomas Jones is associated with the John Williss family of Cecil and Kent County. John Williss’s son Richard was at one time apprenticed to a Thomas Jones. Therefore, the John Willis who witnessed these deeds may have been more likely the John Williss of Cecil/Kent. Having reviewed numerous primary records and secondary sources, we can state with some assurance that most of the early Willises on the Eastern Shore are not associated with the family of John Willis of Dorchester and Caroline Counties. Furthermore, our analysis points to the correct immigrant John Willis who acquired the land named Wantage as described in the earlier article. Henry C. Peden, Jr. & F. Edward Wright, Colonial Families of the Eastern Shore of Maryland, Volume 5, (Westminster, MD: Willow Bend Books, 1999), V:310, 312, and Vernon L. Skinner, Jr. and F. Edward Wright, Colonial Families of the Eastern Shore of Maryland, Volume 22, (Westminster, MD: Willow Bend Books, 2006), XXII:211, 215. William P. Hunt, “A Documentary History of One Branch of the Willis Family of the State of Maryland, c.1680-c.1805,” (New York: Copyrighted as an Unpublished Manuscript, 1975). Peden, Colonial Families, V:312, and Calvin W. Mowbray & Mary I. Mowbray, The Early Settlers of Dorchester County and Their Lands, (Self published, 1981), I:171. A patent issued to Richard Willous for a tract in Dorchester County called “Roaley” (Rondley), 260 acres. James A. McAllister, Jr., Abstracts from the Land Records of Dorchester County, Maryland, Volume 3 (Libers Old 4 ½ – Old 5), (Cambridge, MD, 1961), III:1. The will of Richard Willis dated 21 Oct 1689, proved 8 Jan 1689/90, devised to his sons Richard and John Willis at age 21 the 300 acre plantation called “Rondly.” His daughter Frances Willis would inherit if sons died without issue. Dorchester County Deed Book 4½ Old 1. Note: after Richard’s death, Frances married Edward Fisher, and after Edward died, she married Edward Newton. Gust Skordas, editor, The Early Settlers of Maryland, An Index of the Names of Immigrants Compiled from the Records of Land Patents, 1633-1680, in the Hall of Records, Annapolis, Maryland, (Baltimore: Genealogical Publishing Company, 1968), 24, 510. James Barnaby, Mary Barnaby, Rebecca Barnaby, Elizabeth Barnaby were transported by 1665 (Book 8:19), James Barnaby, Jr., of Somerset County was transported by 1665 (Book 11:309); and James Willis was transported by 1665 (Book 9:94). FHL Film No. 13073, Maryland Land Office, Book 24:382, and FHL Film NO. 13075, Maryland Land Office, Book 29:430. A 27 Sep 1681 survey for Samuel Cooper certified 150 acres called Amity in Somerset County located on north side of Pocomoke River about 5 miles from the river. On 30 Nov 1861, the tract was assigned to Thomas Willis and the patent issued on 10 Aug 1683. Jane Baldwin Cotton, The Maryland Calendar of Wills, 1685-1702, (Baltimore: Kohn & Pollock, 1904, reprinted Westminster, MD: Family Line Publications, 1988), II:195. Will of John Willis, Cecil County, dated 13 May 1698, proved 4 Mar 1699, gave to wife Dorothy, executrix, his dwelling plantation during her life; to son John said plantation at death of his mother and 200 acres; to son Richard 200 acres adjoining the plantation; to daughter Mary 200 acres adjoining Richard Hill’s property. In the event of death of all children without issue, the estate would pass to poor Quakers. Cecil County, MD, Will Book 6:362. V. L. Skinner, Jr., Abstracts of the Testamentary Proceedings of the Prerogative Court of Maryland, (Baltimore: Clearfield Company, Inc., 2007), XI:130. In a Court Session on 22 Nov 1708, in the probate of John Willis of Cecil County, accounts were filed from Kent County of William Hopkins & his wife Dorothy, executrix of John Willis, dated 22 Feb 1708. Probate Book 21:79. Jane Baldwin Cotton and Roberta Bolling Henry, The Maryland Calendar of Wills, 1713-1720, (Baltimore, 1914, reprinted, Westminster, MD: Family Line Publications, 1988) IV:101. Will of John Willis, cordwinder, dated 1 Jan 1706, proved 11 Feb 1716, devised to brother Richard, John’s dwelling plantation and personalty which is in the hands of James Murphy. Richard was to be under the care and management of William Hopkins until of age. Will Book 14:352. The Perogative Court of Maryland had jurisdiction over all probate in Provincial Maryland. Initially, all probate was done in person at the capital in St. Mary’s County. Later, the appearances were conducted at the various County Courts, but copies of all records were filed or were supposed to be filed at the capital. If not filed timely, the Perogative Court would issue a summons to be executed by the county Sheriff. Skinner, Testamentary Proceedings of the Prerogative Court, IX:6. Court Session Jul 1700 – In the probate of John Willis, exhibited from Cecil County were the accounts of Dorothy Willis executrix of John Willis. Probate Book 18B:9. (Cecil County Monthly Meeting recorded that John Willis died 24 Oct 1699 ). Id. at124, Court Session 1702 – In the probate of John Willis, the Court ordered the Sheriff of Dorchester County to summon Dorothy Willis, administratrix of John Willis. The Sheriff’s return to the court was “NEI,” meaning “non est inventar” (not found). Probate Book 19A:89., and at 152, Court Session 1702 – In the probate of John Willis, the Court ordered the Sheriff of Dorchester Co to summon Dorothy Willis, administratrix of John Willis. The Sheriff’s return to the court was, “No such person.” Probate Book 19A:126. Skinner, Testamentary Proceedings of the Prerogative Court, XI: 130. Court Session, 22 Nov 1708 – In the probate of John Willis of Cecil County, accounts were exhibited from Kent County of William Hopkins & his wife Dorothy, executrix of John Willis, dated 22 Feb 1708. Probate Book 21:79. Hunt, “One Branch of the Willis Family”, 1. John Camden Hotten, The Original Lists of Persons of Quality: Emigrants; Religious Exiles; Political Rebels; Serving Men Sold for a Term of Years; Apprentices; Children Stolen; Maidens Pressed; and Others Who Went from Great Britain to the American Plantations, 1600-1700, London, 1874, reprinted, Baltimore: Genealogical Printing Co., Inc., 1983), 459. The records are from St. Michaels Parish in Barbados. Carson Gibbs, Jr., A Supplement to the Early Settlers of Maryland, (Annapolis, MD: Maryland State Archives, 1997), vi-viii. Gust Skordas, editor, The Early Settlers of Maryland, An Index of the Names of Immigrants Compiled from the Records of Land Patents, 1633-1680, in the Hall of Records, Annapolis, Maryland, (Baltimore: Genealogical Publishing Company, 1968), 510. Skordas, Early Settlers, 510, and Gibbs, Supplement to Early Settlers, 242. Gibbs, Supplement to Early Settlers, 242. John Willis had one headright by 1666. Patent Book GG:42 Archives Film SR 8205, Transcript Book 10:599 Film SR 7352. Skordas, Early Settlers, 510, and, Peter Wilson Coldham, The Complete Book of Emigrants, 1661-1699, (Baltimore: Genealogical Publishing Co., Inc., 1990), II:471. Coldham at 471, and Phillimore, Berkshire Registers, I:34, Leonard Willis and Margaret Powell, 8 Sep 1652; I:39, Leonard Willis and Anne Bell, 10 Sep 1659. Henry, born in 1663, fits as a son of either marriage. There is no proved connection between John Willis Sr. and Leonard and Henry of Wantage. McAllister, Land Records of Dorchester County, II:52, 53. 4 Old 3-4 – 1 May 1680, Thomas Foulks and wife Sarah to Wm Dorrington, release of property left to Sarah by John Cornelius; Peter Johnson and James his son; and Thomas Fisher, late husband of the said Sarah. Witnesses: John Willis, Wm Reese, Thos Jones, Dorchester County Deed Book 4 Old 3-4., and II:53, 2 May 1680, William Dorrington to Thomas Foulkes, Chirurgeon [sic, surgeon], bill for 14K pounds of tobacco to be paid by Dorrington to Foulkes. Witnesses John Willis, Wm Reese, Thos Jones. Dorchester County Deed Book 4 Old 4. I like my Lindsey ancestors for a number of reasons. First, our second son Ryan Willis and first grandchild Alexandra Willis have the middle name Lindsey. That name and the entire family line have therefore acquired a certain cachet, a je ne sais quoi, merely by association with those two fabulous people. Second, there is a family legend associated with my most recent male Lindsey ancestor, who lived from 1811 to 1883. The legend assured me there would be absolutely no doubt when I found him that I had bagged the right Lindsey. Third, my North Carolina Lindsey ancestors were Methodists. Serious Methodists, with names like John Wesley Lindsey and Asbury Lindsey. I have found very few slave owners in my extended Lindsey family. Some of them had the financial wherewithal to own slaves, which suggests they might have had some principled opposition to slavery. Fourth, I have become friends via email with some really nice Lindseys. Several of them are my cousins, and all of them are good Lindsey researchers who are happy to share their research. Finally, I am quite fond of my ancestor Edward Buxton Lindsey, father of my great-grandmother Amanda Addieanna Lindsey Rankin, notwithstanding that he was a family embarrassment as far as Amanda and her family were concerned. My father Jim Leigh Rankin kick-started our family history research. He was “bitten by the genealogy bug,” as he liked to put it, about the time he retired in 1968. He and his big sister Louise Rankin Jordan trekked all over north Louisiana picking the brains of every known relative in the area. That is what every “how to do genealogy” book tells beginners to do right off the bat. Not only does it provide hard facts – names and dates and locations – it also produces colorful family legends, which are sometimes even better than facts. Daddy’s detective work unearthed two family legends, both of which concerned Lindsey ancestors. Daddy unquestionably learned from those interviews that his grandfather John Allen Rankin married Amanda Addieanna Lindsey. However, I don’t think Daddy was ever quite sure that he had identified Amanda’s father. What he knew for certain about his great-grandfather Lindsey he learned from his cousin Norene Robinson, neé Sale. Norene was well-acquainted with their grandmother Amanda Lindsey Rankin, who lived with the Sale family at one time. Norene’s mother, neé Anna Belle Rankin, was Amanda’s daughter. Amanda lived until 1920, when Norene was twenty-eight. In short, Cousin Norene was a highly credible witness concerning Amanda’s family. Norene told Daddy that Amanda Lindsey Rankin’s father had been married four times. Four times. So far as I had known, no one in my father’s family had ever been divorced until his generation came along, and then there was just his cousin Elizabeth, who kept marrying men who turned out to be bad choices. On the other hand, my generation of Rankin first cousins has more divorces than long-term marriages. Go figure. Divorces were not all that common in the Reconstruction south, however. Amanda was apparently somewhat chagrined by her father’s remarkable number of marriages, which included two divorces and two marriages to women who were considerably younger than he was. Four marriages constitute a legend you can get your hands around, research-wise. Unfortunately, Cousin Norene could not recall the given name of Amanda’s father, or at least his name did not make it into Daddy’s ancestor charts. His notes do include a census listing for the right man: Edward B. Lindsey of Drew County, Arkansas. In the 1850 census for that county, Amanda A. Lindsey, age five, was listed in the household of Edward B., his wife Elizabeth, and a host of other children. The census listing says that Amanda was born in Mississippi in 1845, which is consistent with the birth date on her Claiborne Parish tombstone and her state of birth from later census records. At first glance, the Amanda in Edward B. Lindsey’s household looks like exactly the right Amanda A. Lindsey. Some time between late 1863 and mid-1865, Edward B. Lindsey, his eldest son William A. Lindsey, and Amanda A. Lindsey moved from Drew County to Claiborne Parish, Louisiana. On July 20, 1865, J. A. Rankins [sic] married Amanda A. Lindsey. The Lindseys and Rankins immediately began leaving evidence in the records that they were closely related. First, William A. Lindsey and his wife Frances appeared as grantors in a deed witnessed by both E. B. Lindsey and John A. Rankin. In another deed, John Rankin and his wife – expressly identified as Amanda A. Lindsey, one of those peculiar quirks of Louisiana law – sold some land, and E. B. Lindsey witnessed the deed. Considering those deeds, plus Amanda’s appearance in Edward’s household in 1850, there is no reason to doubt that Edward was Amanda’s close relation. Any residual doubt that Edward was her father (rather than, say, her uncle or cousin) could be banished by proving that Edward had four wives. As it turned out, three of them appeared with him in a census. Moreover, there are surviving marriage records for each wife in four different states, something I would have deemed wildly against the odds. In short, Edward Buxton Lindsey is conclusively proved as my great-great grandfather. There is a most peculiar thing about that obituary: it named Elizabeth Jane’s parents, even providing detail about where they had lived, but failed to identify her husband. What is that all about? Who wrote the obit? Presumably, J. M. Carr, who was a Methodist Episcopal minister in Drew County. Less than two years later, Reverend Carr officiated at Edward’s marriage to Ruth B. Crook, a wealthy woman with several children. Perhaps here is my father’s problem with deciding whether Edward was Amanda’s father: the 1860 census for Edward Lindsey’s Drew County household lists Ruth and her minor Crook children, but no Lindsey children. In fact, I couldn’t find the Lindsey children anywhere in 1860, in Drew County or elsewhere. They were probably right there in their father’s household, and Ruth (or whomever responded to the census enumerator) just didn’t bother to name them. If that is right, it reinforces the old saw that one of the biggest mistakes one can make in family history research is to believe that the census records are 100% correct. Ruth and Edward’s marriage didn’t last: she was wife number two only briefly. I have not found an Arkansas divorce record, although that doesn’t mean much. Suggesting that a legal divorce did in fact take place, Ruth appeared as a head of household in the 1870 census under her former surname, Crook. Restoring her former name seems to say that Ruth was very serious about not wanting to retain any Lindsey aura whatsoever. The Drew County deed records indicate that the Lindsey-Crook marriage may already have been coming apart by the time the census enumerator visited the Lindsey-Crook household in July of 1860. A month earlier, Ruth had filed with the Drew County court a list of her fairly substantial separate property. The legal effect was to protect her assets from her husband’s control and debts. The filing strongly suggests that Ruth was contemplating (or had already initiated) a divorce, or that Edward had turned out to be financially irresponsible. Or both. Perhaps Ruth had already kicked Edward and his children out of the house when the census enumerator came around in July, but the enumerator, who was naturally a stickler for the patriarchal rules, insisted that her husband must be identified as the head of household so long as she was still married. That obviously qualifies as one of my flights of fancy, although I frankly find it impossible to imagine Edward and Ruth continuing to cohabit after her separate property filing. However, the census rules required listing the names of everyone living in the household, so either Edward was living there or Ruth wasn’t willing to admit she had kicked him out. Perhaps Edward was in the dark about the separate property filing. Moving on, Edward survived the Civil War without a hitch. Unlike my Arkansas Rankin family, with two soldiers fighting on each side, Edward did not participate in active service. That probably had nothing to do with Methodist principles. Edward was just too old to be conscript fodder. Further, he wasn’t sufficiently wealthy or politically connected to be an officer. Instead, in October 1863, Edward enlisted in the Monticello Home Guard. With civil authority collapsing in many parts of Arkansas and Confederate troops being sent away, local jurisdictions were encouraged to form companies of “home guards” to protect persons and property, enforce the conscript law, and support Confederate troops when requested. As one would expect, the home guards were largely composed of men who were too old for regular military service. The Monticello Home Guard, for example, consisted of forty-seven men between the ages of thirty-eight and sixty-two – with an average age of fifty years. Consequently, it was popularly known as the “Old Man’s Company.” Edward was fifty-two when he enlisted. He was a private. I can visualize him marching with a bunch of other old play soldiers on a parade field, albeit in considerably better shape than the others, since he had two very young wives in his future. I would dearly love to have a picture of Edward. By late 1862, Edward had apparently sold his Drew County land. By July 1865, when his daughter Amanda married John Allen Rankin, Edward had moved to Claiborne Parish. Amanda, who was only twenty when she married, almost certainly did not migrate on her own. Four months after Amanda married John Allen, Edward married wife number three, Elizabeth J. Marshall, in Claiborne Parish. For reasons unknown – perhaps Amanda’s patent disapproval of a stepmother who was a quarter-century younger than Edward – the Lindsey newlyweds subsequently moved to Texas. In the 1870 census, Edward, now fifty-nine, and wife Elizabeth, age thirty-four, were listed in Woodville, Tyler County, Texas along with their one-year-old son, Edward Lindsey Jr. Two years later, still in Tyler County, Edward married wife number four: Pamelia Dean, a widow or divorceé who was more than twenty years his junior. I don’t have any proof regarding what happened to Elizabeth J. Marshall Lindsey. However, it is almost certain that she died, because Edward B. Lindsey Sr. wound up with custody of young Edward Jr. Even a century later, that would have been highly unlikely if Edward Jr.’s mother had been alive. If it is correct that Elizabeth died, then she was the second woman named Elizabeth J. who up and died on Edward. Edward’s marriage to Pamelia Dean, like his marriage to Ruth Crook, ended in divorce. An ex-wife in the neighborhood must have been enough to take the shine off Texas for Edward Sr. He was back in Claiborne Parish by 1880, age sixty-nine, with his eleven-year-old son Edward Jr. in tow and no further marriages in store. My heart goes out to both of them. There is a reason that young people have children. The 1880 census, his last, identified Edward Sr. as a dry goods merchant, although he had called himself a farmer in all prior censuses. Perhaps he was too worn out to farm, or maybe he finally just gave up trying to make a living off the land. The probate records for Claiborne Parish establish that Edward Sr. died there in January of 1883. He must have been buried somewhere in Claiborne Parish. Joseph Day, a doctor who had no Lindsey family connection that I can find other than having been one of Edward’s creditors, administered Edward’s estate. It yielded $380.78 after debts were paid – plenty of money for a tombstone, but I can’t find one. The Claiborne Parish probate records say that Edward had six heirs, including his son E. B. Lindsey. The other heirs were William A. Lindsey, Mrs. J. A. Rankin, James Burton, Mrs. N. J. Morley (Nancy Jane Lindsey Morley, wife of George Morley), and John H. Lindsey. Edward Lindsey was underage and therefore represented by a guardian (called a “tutor” in Louisiana law). The tutor was one J. M. Kight, no known relationship to the Lindsey family. All I know is that Mr. Kight resided in Webster Parish, immediately west of Claiborne Parish. In fact, the Kight family lived just a few houses down from Amanda Lindsey Rankin, Edward Jr.’s half-sister. I have not found any further record of Edward B. Lindsey Jr., orphaned at a tender age. As it turned out, Edward Sr. lost both his parents by 1817, when he was only six. I will save that story for another day. 1900 federal census, Haynesville, Claiborne Parish, LA, p. 55, household of A. C. sale with mother-in-law Amanda Rankin, wife Annie Sale, daughter Norine [sic] Sale, and other children. 1880 federal census, Webster Parish, LA, dwelling #285, p. 219, household of J. A. Rankin, born MS, with wife Amanda A. Rankin, born MS, daughter Anna Belle Rankin, and other children. 1900 federal census, Haynesville, Claiborne Parish, LA, p. 55, Norine Sale was born 1892; John Purnell Frazier and Wanda Volentine Head, Cemetery Inscriptions of Claiborne Parish, Louisiana, Volume I (Shreveport: J & W Enterprises, 1985), Haynesville Cemetery tombstone for Amanda A. Rankin, born 19 Apr 1845, died 7 Oct 1920. 1850 federal census, Drew Co., AR, Spring Hill Twp., p. 94, dwelling #270, listing for E. B. Lindsey, 39, farmer, born NC, Elizabeth J. Lindsey, 38, born GA, and nine children, including Amanda A. Lindsey, age 5, born MS.
 Willie Huffman Farley, Claiborne Parish, Louisiana Marriage Records, 1849-1940 (Shreveport: J & W Enterprises, 1984), abstract of marriage record for 20 Jul 1865, J. A. Rankins and Amanda A. Lindsey, Book 1, Folio 320. FHL Film #265,980, Claiborne Parish Deed Book J: 65, deed dated 24 Jan 1866 from William A. Lindsey and wife Francis Jane Marary (sic, Merony) of Claiborne Parish to Lucy C. Lindsey, 240 acres, witnessed by E. B. Lindsey and John A. Rankin, et al. ; Jennie Belle Lyle, Marriage Record Book B, Drew Co., Arkansas (Little Rock: Democrat Printing & Lithography Co., 1966), marriage of William A. Lindsey and Francis Merony, 20 Oct 1852. FHL Film #265,980, Claiborne Parish Deed Book J: 226, deed dated 15 Aug 1870 from John A. Rankin and wife Amanda A. Lindsey to Lucy Lindsey, all of Claiborne, 9 acres, witnesses E. B. Lindsey and S. M. Newsom. 1850 federal census, Drew Co., AR, p. 94, household of E. B. and Elizabeth J. Lindsey; 1860 federal census, Drew Co., AR, p. 103, Edward and Ruth Lindsey; 1870 federal census, Tyler Co., TX, p. 392, Edward and Elizabeth J. Lindsey. Family Adventures, Early Alabama Marriages 1813 – 1850, (San Antonio: 1991), marriage record for Edward B. Lindsey and Elizabeth J. Odom, 30 Jun 1832, Pike Co., AL; Lyle, Marriage Record Book B, Drew Co., Arkansas, marriage record for E. B. Lindsey and Ruth B. Crook, 16 Sep 1856; Farley, Claiborne Parish, Louisiana Marriage Records, marriage of E. B. Lendsey and E. J. Marshall, 15 Nov 1865; and Frances T. Ingmire, Marriage Records of Tyler County, Texas 1847 – 1888 (St. Louis: 1981), marriage of Ed. B. Lindsey and Permelia Dean, 20 Nov 1872. Family Adventures, Early Alabama Marriages. 1850 federal census, Drew County, Ark., Spring Hill Twp., p. 94, dwelling #270, listing for E. B. Lindsey, 39, farmer, born NC, Elizabeth J. Lindsey, 38, born GA, William A. Lindsey, 17, AL, James R. Lindsey, 16, AL, Nancy J. Lindsey, 12, AL, John H. Lindsey, 11, AL, Charity A. Lindsey, 9, AL, Elizabeth W. Lindsey, 7, AL, Amanda A. Lindsey, 5, MS, Edward C. Lindsey, 2, AR, and Thomas E. Lindsey, 9 months, AR. E. M. Tipton, Marriages and Obituaries from the New Orleans Christian Advocate 1851-1860, Vol. 1 (Bossier City, LA: Tipton Printing & Publishing,1980). Elizabeth Jane Odom Lindsey’s obit appeared in the Advocate issue of 25 Nov. 1854, No. 3, p. 3, col. 1. Lyle, Marriage Record Book B, Drew Co., Arkansas, identifying J. M. Carr as an M. E. minister. Id., Marriage Book B:140, 16 Sep 1856, marriage of E. B. Lindsey, 45, and Ruth B. Crook, 48, J. M. Carr officiating; see notes 17 and 20. 1860 federal census, Drew Co., AR, Marion Twp., p. 103, dwelling #167, household of E. B. Lindsey, farmer, 48, with Ruth Lindsey, 55, Susan Crook, 17, James Crook, 15, and Ruth Crook, 13. 1870 federal census, Drew Co., AR, Monticello P.O., p. 629, dwelling #465, listing for Ruth Crook, 63. 1860 federal census, Drew Co., AR, p. 103, listing for E. B. Lindsey. Census taken on July 13th, 1860. FHL Film #981,521, Drew Co. Deed Book F: 268, 18 Jun 1860 filing in the real property records of Drew County containing a schedule of the separate property of Ruth B. Lindsey, wife of E. B. Lindsey. The list included inter alia seven slaves, a horse, two yoke oxen, eleven head of cattle, twenty-seven sheep, fifteen hogs, a wagon, buggy, two bureaus, bookcase, clock, six bedsteads, two dozen chairs, a safe, and 200 acres. Edward had no scruples preventing him from marrying Ruth Crook, who owned seven slaves. See id. I cannot find my source for that tidbit and am not inclined to bother relocating it, considering that the chances are virtually nil that anyone will ever give a fig. For the record, however, the sentence beginning “with civil authority collapsing” and much of the remainder of the paragraph are roughly verbatim quotes from the source, whatever it was. FHL Film #981,522, deeds dated 4 Nov 1862 and 30 Dec 1862 recorded in Drew Co., AR Deed Book G: 452 and 476, respectively, conveying Edward Lindsey’s tracts in Section 24, Twp 12 South, Range 7 West. Farley, Claiborne Parish, Louisiana Marriage Records, 15 Nov 1865 marriage bond, E. B. Lendsey and E. J. Marshall, Marriage Book 1, Folio 336. 1870 federal census, Tyler Co., TX, Woodville Beat, p. 392, dwelling #321, listing for Edw. Lindsey, 59, farmer, born NC, with Eliz. Lindsey, 34, born ALA, and Edward Lindsey, 1, born TX. Ingmire, Marriage Records of Tyler County, Texas 1847 – 1888, Pamelia Dean married Edward B. Lindsey 20 Nov 1872. See notes 26 and 27 for Pamelia’s and Edward’s ages in 1880. 1880 federal census, Tyler Co., TX, p. 397, dwelling #16, listing for Permelia J. Lindsey, age 47, divorced or widowed. She must have been divorced, since Edward was still alive in 1880, see note 27. 1880 federal census, Claiborne Parish, LA, p. 285, listing for Edward B. Lindsey, dry goods merchant, 69, born NC, parents born NC, listed with Edward B. Lindsey, son, 11, at school, born TX, father born NC, mother born MS. Id. ; notes 13, 17 and 26. FHL Film #265,999, Claiborne Parish, LA Probate Record Book E: 392. Id., 31 Mar 1883 report of administrator Joseph W. Day on the sale of Edward B. Lindsey’s land. Id., Claiborne Parish Probate Record Book E: 398, 31 Aug 1883 report by administrator. 1880 federal census, Webster Parish, LA, p. 219, dwelling #297, listing for J. M. Kight, 38, farmer, and his family; also on p. 219, dwelling #285, listing for J. A. Rankin, wife Amanda and family. The objectives of this analysis were (1) to determine how many William Lindseys lived in Brunswick County, Virginia circa the 1750s and (2) to identify which William Lindsey of Brunswick, if any, moved to North Carolina. My methodology was to differentiate among the Lindsey families who appeared in Brunswick based on where they lived and with whom they associated. For example, one William Lindsey appeared frequently as a party or witness to deeds in which a man named Huckaby or Denton was also either a party or a witness. Another William Lindsey owned land in Brunswick on Wildcat Creek and frequently appeared in deeds witnessed by one or more sons who were proved by his will. Based on consistently different locations and personal associations that did not overlap, I concluded that there were three different William Lindseys living in Brunswick in the mid-1700s. Each of these men first appeared in Brunswick between 1743 and 1750. The individual records that I assembled for each Lindsey are listed chronologically in the tables below. Because all of the evidence regarding these three Lindseys is laid out in some detail (along with citations to county records), I did not footnote the following brief summary of my conclusions. The first William Lindsey to appear in Brunswick – whom I have designated “William #1″ or “William Sr.” – owned land in Brunswick on Little Meadow/Three Creeks. He most likely lived in the county by at least April 1743, when he witnessed a conveyance between two parties who were both identified as residents of Brunswick. He evidently made one or more trips to Edgecombe County, North Carolina while he still resided in Virginia, because there is at least one record in which he acknowledged an Edgecombe deed (requiring him to be in court in person) while he was still identifying himself as a resident of Brunswick. William #1 sold what appears to have been all of his Brunswick land in 1754 and was a resident of Edgecombe County by at least 1758. He lived and owned land on Rocky Creek in that part of Edgecombe that is now Halifax County. His wife Mary appeared with him in both Brunswick and Edgecombe from 1754 through 1763. The records do not establish whether Mary was his first wife or whether she was the mother of his children. William #1 had a son, also named William (to whom I shall refer as William Jr.), who made his first appearance in the Halifax records in 1763. William Jr. witnessed a deed in January of that year (a conveyance to William #1) and proved a deed in November (also a conveyance to William #1). The latter deed establishes that William Jr. was born by at least 1742. The deeds were the initial basis on which I concluded the two men were father and son. I found no estate records for William #1 in either North Carolina or Virginia. He had almost certainly died before 28 July 1772, when William (Junior), Joseph and John Lindsey conveyed a tract on Rocky Swamp that had been acquired earlier by William #1. That conveyance is persuasive (conclusive, in my opinion) evidence that William Jr., Joseph and John were sons of William #1. I have not found a deed in which William #1 conveyed that Rocky Swamp tract to William, Joseph and John. Inheritance is the only other basis to explain the ownership of the land by those three men. Estate records for that time and place are, unfortunately, mostly nonexistent. William #1 (or William Sr.) of Brunswick and Edgecombe-Halifax and his three sons William Jr., Joseph and John are almost certainly the ancestors of the Lindseys who appeared in Nash and Franklin Counties, North Carolina around the turn of the century. My last conclusively proved Lindsey ancestor – William Lindsey III who died in 1817 in Nash County, father of Edward B. Lindsey – is among them. The second William Lindsey in Brunswick County – “William #2″ – lived and owned land on Wild Cat Creek and Tan Fall (or Tan Fat or Tan Vat) Branch. His wife Jane appeared with him in Brunswick deed records from 1750 through 1757. William #2 left a Brunswick will dated May 1766 and proved in September 1768. He had proved sons James and Caleb (named in his will), an unproved but highly probable son John, proved daughter Sarah Lindsey Copland, and an unproved but highly probable daughter Winifred Lindsey Durham. Other children are possible. William #2 is definitely not the same man as William #1. First, William #1 moved to Edgecombe, while William #2 stayed in Brunswick and left a will there. Second, William #1 was married to a woman named Mary during 1754 through at least 1763. William #2, on the other hand, was married to a woman named Jane during at least 1750 through 1757. Because those dates overlap, it follows that Mary’s husband was a different man than Jane’s husband. Further, William #2 appears to be from a generation prior to William #1. Caleb, a proved son of William #2, identified himself in a 1763 deed as Caleb Senior. That suggests that a Caleb Jr., presumably a grandson of William #2, has reached adulthood. Caleb Junior must therefore have been born by 1742. The two elder sons of William #1 were also born circa 1740. Thus, William #2’s son Caleb and William #1 appear to be members of the same generation. I found no connections whatsoever in the Brunswick or Edgecombe records between William #2 and William #1. Nor did I find any evidence in the Brunswick records that expressly connects William #2 to any of the North Carolina Lindseys. That doesn’t mean that the line of William #2 did not move to North Carolina, which some of them may well have done. I am reasonably certain, however, that the John Lindsey who left a will in Halifax County, North Carolina dated December 1800 and proved February 1801 (“Halifax John”) was not the same man as the John Lindsey who was a probable son of William #2. Further, neither John, probable son of William #2, nor Halifax John who died in 1801, was the same man as John, the brother of Joseph and William Jr. (sons of William #1). A third William Lindsey – “William of New Kent” – appeared in Brunswick in 1748 and owned land on Briery Branch. He also bought and sold a tract on Crabtree Creek (also known as Miles Creek) in the southern part of Lunenburg that subsequently became Mecklenburg. The deed records establish that William of New Kent was not the same man as William #1. William of New Kent recited that he was still “of New Kent” in a 1748 deed, while William #1 was already “of Brunswick” in a 1744 deed. William of New Kent was also not the same man as William #2, because William of New Kent lived in Lunenburg and served on juries there (which required residency) during a period in the 1750s when William #2 was residing in Brunswick. The last Brunswick record I found for William of New Kent is dated 1765, after which he disappeared from the Brunswick records. In 1769, William appeared in a Mecklenburg County deed as a witness. I found no will or estate administration for William of New Kent in either Brunswick, Lunenburg or Mecklenburg. So far as I have found, he owned no land after he sold his tract on Crabtree/Miles Creek in 1760. Assuming that he had no valuable personal property, he may have died and left no trace in the probate records. Alternatively, he may have left the Mecklenburg area. William of New Kent appeared frequently in records along with men named Russell and Twitty. In particular, William was involved with a man named Richard Russell and his wife Margaret Russell, both of whom are identified in the St. Peter’s Parish Register in New Kent County as the parents of a daughter Mary Russell, born in St. Peter’s Parish in New Kent County in 1738. Thus, William of New Kent may well have migrated to Brunswick along with the Russells, and might have been related to them by marriage. Detailed records for each of the above three William Lindseys are contained in the tables below, preceded by a brief description of the logic I used to choose records for each of the three tables. I assembled county records concerning William #1 in a series of steps, as follows. There is recurrence of the name Denton in Lindsey records in both Brunswick, Virginia and in Edgecombe and Halifax, North Carolina. I therefore began by collecting all records involving both William Lindsey and anyone named Denton in Brunswick, Edgecombe or Halifax. At least one of the deeds mentioning William Lindsey and a Denton also involved Samuel Huckaby. Consequently, I added all records involving both a Lindsey and a Huckaby. The William Lindsey who was connected to the Dentons and Huckabys owned land on Rocky Swamp in Edgecombe/Halifax, so I added any additional Edgecombe or Halifax deeds involving Lindseys and that creek. The above records established that William #1 owned land on “Little Meadow” near Three Creeks in Brunswick. I therefore added any additional Brunswick records involving a Lindsey and either Three Creeks or Little Meadows. My comments in the tables below are in italics. Table #1 – William Lindsey #1 or William Sr.
28 Jul 1772 William Lindsey, Joseph Lindsey and John Lindsay to Jesse Weaver, £68 proclamation money, 125A which was part of a patent to John Edwards 17 Jun 1741 on the west side of Rocky Swamp adj Spring Branch, Smiths Branch, David Chapman. Witnesses Thomas Wiggins, Henry Wiggins, Edward Jordin. Table #2: William Lindsey #2 and wife Jane of Wildcat Cr. For the following table, I collected all the records that can be attributed with certainty to the William Lindsey of Wildcat Creek and Tan Fat Branch who left a 1768 will in Brunswick. Thus, each record contains either (1) the name of one of those creeks and any male Lindsey or (2) any mention of James or Caleb Lindsey, who are proved sons of William #2. 24 Mar 1755 William Linsay of Brunswick to James Lindsay, same, £10 VA, 100A east side Wildcatt Cr. adj William Lindsay, head _____ of the Bee Br. Witness Philemon Bowers, George Durham, Caleb Lindsey. William signs. Same day, William Lindsay of Brunswick to Caleb Lindsay, same, £10 VA, 100A east side Wildcat Cr. beginning at mouth of Bee Br., a direct line between said Caleb Lindsey and James Lindsey, the east branch of Wildcat Cr. Witnesses James Lindsay, Phillemon Bowers, George Durham. William signs. 23 Aug 1766 Will of George Durham of St. Andrews Parish, Brunswick, dated 23 Aug 1766 proved 23 Feb 1767. 182A on branches of Great Cr. adj Col. Nicholas Edmunds et al., sell to pay debts. Son James Lindsey Durham, land & plantation where I now live. Son Humphry Durham, mare, saddle, cow & calf. Son John, my gun, cow & calf. Daughter Margret Halcombe, heifer. 10 Nov 1766 Caleb Lindsey & John Lindsey of Brunswick to John Allen of Dinwiddie Co., £60 VA, 150A on both sides Wildcat Cr. beginning at mouth of Bee Br. to William Lindsey’s old line, east fork of Wildcat Cr., the Tanfat Br. Both sign in full. Witnesses Nathaniel Roberson, James Lindsey, John Biggs (x) or Bigge. Proved by all three witnesses 23 Feb 1767. Original of Deed Book 8: 440 or 441? William Lindsey of New Kent bought a tract on Briery Creek in a conveyance to him by Richard Russell. Thomas Twitty and Stephen Moss were witnesses. I therefore included in this table all Lindsey records having any reference to a Lindsey and either Briery Cr., Twitty, Russell, or Moss. Note: see Appendix 2 regarding a Lindsey whose middle name was Moss. Every genealogist knows that many family trees on the internet aren’t worth the paper it would take to print them. Perhaps the most serious rookie mistake a family history researcher can make is to import data from someone else’s family tree without confirming it with independent research. Some of us learned that lesson the hard way. When I was just getting started in this hobby in the 1990s, I sent a chart for one of my lines (as requested) to the administrator of the Graves Family Association website. The chart included information I had obtained from other researchers purporting to identify the forbears of my last proved Graves ancestor. Unfortunately, I had not confirmed those alleged ancestors with my own research. I wish I had remembered that and deleted those names before I forwarded the chart. The website administrator replied with a blistering email excoriating me for perpetuating a fiction which all serious researchers had long since discarded. My screen and my red face were both too hot to touch when I read that email. The fact is that all family history researchers make mistakes, even without naïvely adopting someone else’s data. It is the nature of the hobby. Original records are incomplete or the courthouse burned down entirely, handwriting is faded, blurry or just lousy, and our ancestors tended to recycle the same given names ad nauseam, producing an error called “same name confusion.” Other mistakes are perpetrated and then perpetuated by the aura of accuracy that accompanies information that makes it into print. If a printed history states, e.g., that Joseph Rankin of New Castle County, Delaware (1704-1764) had a son named Samuel Rankin who married Eleanor (“Ellen”) Alexander, that particular “fact” is thenceforth cast in concrete. That is so despite the lack of any supporting evidence whatsoever in actual records and y-DNA tests that disprove a genetic relationship. That is precisely the case with Joseph and Samuel. Some mistakes are just simple errors exacerbated by a dose of carelessness. Who can believe an ancestry chart asserting that a woman who was born between 1740 and 1743 was the mother of a man born in 1749? Or a chart saying that a man married Miss Smith months after he was already dead and his will probated? Happens all the time. There is just such an error in research concerning one of the Rankin families of Guilford County, North Carolina. The error appears in a number of Rankin family trees on the Family Search and Ancestry websites. It is probably attributable to one published Rankin history which wrongly interpreted the 1795 will of Robert Rankin as being the will of the “patriarch” – the eldest immigrant – of his family line in Guilford. Robert Rankin the patriarch (let’s call him “Old Robert” for short) had a wife named Rebecca, maiden name unknown. Old Robert and Rebecca had a son named George. The 1795 will identified the testator as “Robert Rankin Senior” of Guilford County, a designation occasionally used for Old Robert in the early days of the county. Robert also devised land to a son named George. He did not name a wife, which proves nothing except that his wife most likely died before he wrote his will. In short, identifying the testator in the 1795 will as Old Robert seems reasonable at first glance. The problem is that Old Robert and Rebecca’s son George died in 1760 – thirty-five years before Robert’s 1795 will. I have heard of people being tardy about updating their wills, but … several decades? C’mon, y’all! Admittedly, Guilford County is tough on Rankin researchers for several reasons. First, there are a dizzying number of country records referencing, e.g., Robert Rankin, Robert Rankin Sr., and/or Robert Rankin Jr. One state grant mentions all three of those names! Second, the line of Old Robert and Rebecca, as was common, used the same names every generation. They favored John, William, Robert, and George, sometimes distinguishing between them with “Jr.” or “Sr.” That didn’t always help, because a man identified as “Jr.” isn’t necessarily the son of “Sr.” Sometimes those designations were used to differentiate between an elder and a younger man who were from different nuclear families – for example, a man and his nephew. Worse, the designations changed: a man called “Robert Jr.” in 1760 became “Robert Sr.” after the elder Robert died. Keeping track of who was “Sr.” and who was “Jr.” isn’t always easy. Finally, Guilford is rough sledding because there were three Rankin “patriarchs” in Guilford: (1) John Rankin (1736-1814) who married Hannah Carson and who is a proved son of Joseph Rankin of Delaware; (2) John’s brother William Rankin (1744-1804), who married Jane Chambers; and (3) Old Robert Rankin and his wife Rebecca, who came to Pennsylvania from Letterkenny Parish, County Donegal, Ireland about 1750 and moved to Guilford County (then Rowan) a few years later. Fortunately, the lines of John Rankin and his brother William Rankin are well-documented, so it is relatively easy to distinguish them from the line of Old Robert and Rebecca. Two simple facts establish that the Robert Rankin who wrote a will and died in 1795 in Guilford County – call him “Robert d. 1795” – was not Old Robert. First, the dates for the records of Buffalo Presbyterian Church show that Old Robert died long before 1795. Second, records concerning the George Rankin who was named as a son in the will of Robert d. 1795 establish that George the devisee was alive and well after 1795. He was not the George who had died thirty-five years earlier. For purposes of this article, however, we are only concerned with Old Robert and Rebecca, their sons George and Robert (who was sometimes called “Robert Jr.” in early Guilford records), and a grandson named – I’m sure you can guess this one – Robert. A few facts about that crew is in order. Rev. Rankin says that George died in 1761, although his will was actually written and proved in 1760. George’s will named his widow Lydia and two minor sons, John and Robert – the grandson we have in mind. George and Lydia’s son John inherited the 480-acre tract on Brushy Fork that Old Robert and Rebecca had given to George. John sold it and left Guilford before 1800. George and Lydia’s other son Robert, grandson of Old Robert, fought in the Revolutionary War and applied for a pension in 1833. Bless his heart, because the application provides useful information. Let’s call him “Rev. War Robert.” His application establishes that Rev. War Robert was born in Guilford County in May 1759 and that he moved to McNairy County, Tennessee in 1830. It is important for this narrative that Rev. War Robert lived into the nineteenth century. Reverend Rankin said there were no records for Buffalo Church “from the organization in 1756 to 1773.” Consequently, Old Robert Rankin, husband of Rebecca, must have died before 1773. Rev. Rankin states that Old Robert died about 1770, although there is no extant tombstone for him in the Buffalo Church cemetery. Old Robert cannot be the same man as the Robert Rankin who died in Guilford in 1795 because Old Robert had been dead for more than two decades by 1795. What about the George named in the will of Robert Rankin d. 1795? … his son George and his three grandsons William Rankin Wilson, Andrew Wilson and Maxwell Wilson, sons of his deceased daughter Mary Rankin and her husband Andrew Wilson. Robert devised his land on Buffalo Creek to George and the three Wilson grandsons. … two unnamed living daughters, each of whom was to receive one-fifth of Robert’s personal estate. Robert’s will plainly demonstrates that he was capable of distinguishing between his children who had died and those who had not. He described his three Wilson grandsons as “sons of my deceased daughter Mary Willson alias Rankin.” Robert describes his son George as … simply George, without stating that George was deceased or that the devise of land was for George’s heirs. The straightforward language of the will makes clear that Robert the testator (even if Old Robert had still been alive in ’95, which he wasn’t) was not referring to a son who died in 1760. Subsequent Guilford County records indicate that Robert the testator was correct: his son George Rankin was still alive in ‘95. About three years after Robert died, George surveyed the land he inherited from his father. Robert’s will included a detailed metes and bounds description of how his land on Buffalo Creek was to “be divided by my estate.” The document filed in the real property records expressly recites that the survey of the tract was required by the will of Robert Rankin, deceased, and by his executor. Some two decades later, George Rankin made a gift of a portion of that tract to his own son – named Robert, of course. Here’s the best advice I could ever give to a rookie genealogist: follow the land. Naturally, there was more than one Robert Rankin living in Guilford County in the late 18th century. We can eliminate anyone from the lines of John Rankin and Hannah Carson or William Rankin and Jean Chambers, because their sons named Robert (John and William both had a son named Robert) lived well past 1795. The testator in 1795 was not Rev. War Robert, son of George and Lydia, because his pension file proves that he died in 1833. The only Robert Rankin in Guilford in 1795 who was old enough to have three grandsons, and who did not live into the nineteenth century, was Robert Rankin (Jr.), son of Old Robert and Rebecca. And there you have it. In a perfect world, Old Robert would also have left an extant will. I suspect that he had already given away everything he owned, particularly his land, before he died. Rev. S. M. Rankin, The Rankin and Wharton Families and Their Genealogy (Salem, Massachusetts: Higginson Book Company, facsimile reprint of the original, copyrighted 1931), p. 52. Rev. Rankin is reliably accurate, so far as I can tell from my own research, with few exceptions. However, y-DNA testing conclusively establishes that the Samuel Rankin who married Eleanor Alexander was not a son of Joseph Rankin of Delaware. https://familysearch.org/search/ and http://home.ancestry.com. The former is free. The latter requires a paid membership. E.g., A. Gregg Moore and Forney A. Rankin, The Rankins of North Carolina (Marietta, GA: A. G. Moore, 1997). Rev. S. M. Rankin, History of Buffalo Presbyterian Church and Her People (Greensboro, NC: J. J. Stone & Co., Printers, 1934) at 27. See also the gift deed in the next footnote. Id. See also Jo White Linn, Rowan County North Carolina Deed Abstracts Vol. 1, 1753 – 1762, Abstracts of Books 1 – 4 (Salisbury, NC), abstract of Deed Book 2: 70, a gift deed dated 13 Apr 1755 from Robert and Rebecca Rankin to George Rankin, for 5 shillings (the usual gift deed “price”), 480 acres on the south side of Brushy Fork. Robert had paid 10 shillings for that tract, a Granville grant. Id., abstract of Deed Book 2: 102. Clayton Genealogical Library microfilm, “NC Guilford County Wills, Books A-B 1771-1838,” File #312, will of Robert Rankin Sr. dated 30 May 1795 proved Nov 1795, giving metes and bounds instructions on how to divide the land he owned on the south side of Buffalo Creek and devising that land to his son George Rankin and grandsons William Rankin Willson, Andrew Willson and Maxwell Willson. Robert also made bequests to his daughter Isobel and two other living daughters who weren’t identified by given name. Clayton Genealogical Library microfilm, “NC Rowan County Will Books A-B 1767-1793,” p. 141, will of George Rankin of Rowan County dated 23 May 1760, proved Oct 1760. Witnesses to the will included Robert Rankin (either George’s father or his brother) and William Denny (George’s brother-in-law, married to George’s sister Ann Rankin Denny). William D. Bennett, Guilford County Deed Book One (Raleigh, NC: Oaky Grove Press, 1990), abstract of Deed Book 1: 504, 16 Dec 1778 state grant to Moses McClain, 200 acres adjacent Jonas Touchstone, Robert McKnight, David Allison, Robert Rankin Jr.’s line, along Robert Rankin Sr.’s line, NC Grant Book No. 33: 83. There is one deed in my Lunenburg Co., VA Winn line in which the grantee and two witnesses to a deed were identified as John Winn, John Winn, and John Winn. No “Sr.” or “Jr.,” or “John Winn, carpenter,” or “John Winn of Amelia County.” Those three men obviously had a sense of whimsy. Lunenburg Deed Book 7: 231. FHL Film No. 6564, New Castle Co., DE Deed Book Y1: 499, deed dated Apr 1768 from grantors John Rankin of Orange Co., NC (a predecessor to Guilford County) and his wife Hannah, and William Rankin of New Castle Co., DE, to grantees Thomas Rankin and Joseph Rankin, both of New Castle, land devised to John and William by their father Joseph Rankin. Witnesses to the deed were neighbors of William and John Rankin in Guilford: Robert Breden, James Donnell and James Simpson. Robert and Rebecca’s immigration date and origin are established by the autobiography of their son, Rev. John Rankin, a Presbyterian minister who became a Shaker. Rankin, History of Buffalo Presbyterian Church, p. 22. See also Futhey and Cope, History of Chester Co., PA (Philadelphia: Louis H. Everts, 1881), reproduction facsimile by Chester County Historical Society (Mt. Vernon, IN: Windmill Publications, Inc. 1996). The 1753 tax list for West Nottingham Township, Chester Co., PA included taxables George Rankin and Robert Rankin. Rankin, History of Buffalo Presbyterian Church, p. 22. E.g., Jo White Linn, Rowan County North Carolina Deed Abstracts Vol. 1, 1753 – 1762, Abstracts of Books 1 – 4 (Salisbury, NC), abstract of Deed Book 4: 100, Granville grant dated 24 Jun 1758 to Robert Rankin, 640 acres on both sides of North Buffalo Creek. That creek flows roughly from southwest to northeast into Buffalo Creek. The creek, and the grant, are located just south of Buffalo Presbyterian Church. Rankin, History of Buffalo Presbyterian Church, p. 27. George and Robert are also proved as sons by deed records. There is only circumstantial evidence for a son John and no evidence that I can find for a daughter Rebecca. The deed and will records also prove a daughter Ann Rankin who married William Denny. Clayton Genealogical Library microfiln, “NC Rowan County Will Books A-B 1767-1793,” p. 141, will of George Rankin of Rowan County dated 23 May 1760, proved Oct 1760. The 1761 date for George’s death appears in every family tree I have seen for Robert and Rebecca. Someone read Rev. Rankin’s book and many people imported the information without checking it. Id. George devised to John the 480-acre tract on Brushy Fork or Brush Creek. John sold 200 acres in August 1784, Guilford Deed Book 3: 101, and the remaining 297 acres in Sep 1796, Deed Book 6: 182. John was listed in the 1790 census for Guilford County but not in 1800. He was a Revolutionary War Soldier and an ordained Presbyterian minister. He struggled with what he saw as the abstract and impersonal nature of Presbyterian doctrine and became a Shaker minister. He went to Tennessee in the late 1790s and wound up in Logan County, KY in a place called “Shakertown.” In one of many Guilford County marriages that makes researchers rip their hair out, he married Rebecca Rankin, a daughter of John Rankin and Hannah Carson. Virgil D. White, Abstracts of Revolutionary War Pension Files, Vol. III: N-Z (Waynesboro, TN: National Historical Publishing Co., 1992), abstract of the pension application of Robert Rankin, W5664. Robert was born 29 May 1759. Wife Mary. NC line. Soldier was born in Guilford and enlisted there. In 1830, he moved to McNairy Co., TN where he applied 20 May 1833. He died there 21 Dec 1840. Soldier had married Mary Moody 22 Nov 1803 in Guilford. Widow applied 12 Jun 1853 from McNairy, age 75. Widow died 11 Jul 1854. Rankin, History of Buffalo Presbyterian Church, p. 122. Raymond Dufau Donnell, Buffalo Presbyterian Church and Cemetery Greensboro, North Carolina (Greensboro, NC: The Guilford County Genealogical Society (1994), second printing March 1996, p. ii, saying that the “earliest written records of the church date from 1773,” and stating that Robert Rankin Sr., “Pioneer … Ruling Elder” died ca. 1770. Clayton Genealogical Library microfilm, “NC Guilford County Wills Books A-B 1771-1838,” File #312, will of Robert Rankin Sr. dated 30 May 1795 proved Nov 1795. Guilford Co. Deed Book 6: 346, 16 Feb 1798. Guilford Co., Deed Book 14: 11, 23 Mar 1819. Rev. S. M. Rankin, The Rankin and Wharton Families and Their Genealogy (Salem, MS: Higginson Book Company facsimile reprint of the 1931 original), p. 55 (John Rankin and Hannah Carson’s son Robert lived from 1780-1866) and p. 149 (William Rankin and Jane Chambers’ son Robert C. Rankin lived 1791-1853). John Willis Sr. was born about 1669 in Wantage, Berkshire County, England. He grew up with fond memories of this village before immigrating to the Province of Maryland as a young man. He gained employment with the Dorchester County Court at Cambridge and married in about 1688. He and his wife initially lived on rented land, raising a family and working off the cost of his passage to the New World. He farmed the rented property as a primary livelihood since the part time nature of work at court sessions did not provide steady or sufficient income. In 1702, John was able to patent his own property and acquired 50 acres, naming it “Wantage” after his hometown. As the years went by, John Jr. learned the carpentry trade and married Mary LNU. They moved to rented land close by. Andrew married Jennet Jones, the neighbors’ daughter, and rented land near William Jones’ property on Shoal Creek. William, the youngest son, married Judith LNU, and they lived at Wantage with the elder Willises and Grace, Eliza and Thomas. Soon, Thomas went to live with his brother John to help farm his rented land. William took over running Wantage, while Judith helped care for an ailing Mrs. Willis. Before long, Mrs. Willis passed away leaving William and Judith along with Grace and Eliza living at Wantage with John Sr.
As John Sr.’s health began to fail in 1712, he made a will rewarding William (and his wife Judith), Grace and Eliza for their steadfast support. John Jr. contested the will, but it was allowed to stand. John Jr. and his brother Andrew each had several children. For the next three hundred years, descendants of these two brothers intermarried with families on the Eastern Shore. The family history is a rich and interesting story of women and men. A handful fought in the revolution. Some were instrumental in establishing the early Methodist church in the region. Most were farmers. Some became doctors. This italicized narrative contains some speculative details about John Willis and his family. However, it is consistent with the provable facts. The following article about the family’s humble beginnings in the New World will present that proof. It is the first installment in a series I hope to publish over the coming years. John Willis Sr. lived from circa 1669 until his death about November 1712. The date of his will in Dorchester County and the beginning of probate prove his date of death. I estimate his birthdate from two facts. First, a deposition in 1730 establishes that one son (Andrew) was born in 1690. Second, a 1746 deposition states that another son (John) was the eldest, making him born by at least 1689 to be older than Andrew. If these sons were only 22 and 23 years old at the time of John Sr.’s death, a reasonable minimum age for him would be 44 or 45 when he died. In that case, John Sr. would have been born in 1667-68 at the latest. (per a discovery after publication of this article, a John Willis is listed in the Berkshire, England Parish Register as born and baptized 3 Jan 1668/9, the son of John and Elizabeth Willis). John Sr. had six children surviving at the time he wrote his will. However, the will only names four of the six. Eldest son John contested the will in part because two children were not named. John Sr. served as the Court Crier at the Dorchester County Court and lived on land a few miles from Cambridge, the county capital. His land named “Wantage” was located on the upper reaches of the north branch of the Blackwater River (now known as the Little Blackwater). Wantage can be tracked to three of his sons, and its name is the best clue to John Sr.’s home of origin. If John, Sr. followed the custom of many of his peers, the name Wantage likely came from his hometown. A village of that name within the Church of England’s Parish of Berkshire is located in Berkshire County, England, about 50 miles west of London and 80 miles from the city of Cambridge. Internet research shows the village currently is home to several Willis families. The Parish Registers for the church at Wantage list marriages from 1538 forward. Among the marriages are three generations of men named John Willis, the last of whom might be the father of John Willis Sr. of Maryland. However, with no conclusive proof this article does not focus on John’s possible parents. John Willis Sr. was not the only person from Wantage, England, in the Province. A common laborer named Henry Willis came to Maryland in August 1684 at age 21 on the John & Elizabeth bound to John Moore of London for four years. The ship’s record names Henry’s father as Leonard Willis. Evidence that another person immigrated from Wantage supports the theory that John Sr. did as well. The possible first appearance in Dorchester County records of John Willis Sr. is in 1694 when a man by that name was an appraiser of the estate of William Pritchett. A John Willis served as appraiser again in 1700 and 1703. It is logical to assume the appraiser in all three cases is the same John Willis. An appraiser had to be sworn to this duty and served only with the approval of the court. We know that John had connections at the court since he served as Court Crier. On the other hand, John Sr. signed his 1712 will with a “mark.” He did not know how to read and write. It is likely that men appointed as appraisers were more educated than John Sr.
John Willis patented land from the provincial land office in 1702, acquiring 50 acres called Wantage on the Blackwater River. As already discussed, John may have named this tract after his hometown. John Willis appeared on the 1704 rent rolls as a planter, indicating he was a landholder. Wantage would remain in the family until 1734. Son John would inherit 12 pence. The will named William Jones and Rice Levena as executors. John Willis Jr., eldest son of the deceased, filed a will contest on 3 December 1712, asking that administration not be granted the executors because there were only two witnesses to the will one of whom was an executor making his witnessing inappropriate. Further, John stated there were two children not mentioned in the will suggesting that his father was not of sound mind at the time of making the will. William Jones, one of the witnesses to the will and a named executor, appeared in support of John Jr. The Court ordered on 20 February 1712/3 that all parties appear in April 1713 to give evidence regarding John Sr.’s mental condition at the time he made his will. I have found nothing resolving the dispute in the Dorchester County court records, nor any reference to the contest in the probate records of the Perogative Court. However, apparently the Court ruled against the contest because probate continued under the named executors. Had the Court sustained the contest, the Court would have nullified the will, appointed an administrator, and the estate would have been distributed according to the rules of intestate distribution … which would have been far more favorable to John Jr. Instead, Inventories and Administration Accounts filed by the named executors for the estate of John Willis in 1714 and 1715 indicate that probate moved forward apace. A few other comments regarding the terms of the will and its administration are in order. First, the will does not name a spouse of John Willis. We can logically assume that she predeceased John. Were she alive, he likely would have named her in the will with a life estate in the land or otherwise provided for her care by their adult children. Last, the will does not use a married surname for either daughter. We conclude that they were unmarried in 1712. Andrew – Andrew is a proved son of John Willis, Sr.
1. An inventory of the estate of John Willis filed at the April 1714 Perogative Court Session names Andrew as a son. 2. Andrew continued to live reasonably close to Wantage and William Jones, his father-in-law, was a former neighbor. Jones, one of the executors of John’s will, owned land adjacent Wantage and is the father of Jennett Jones who married Andrew Willis. Also, Andrew Willis and William Jones are noted in the 1718 will of Thomas Ennals and in a 1722 land sale as having had land adjoining each other at head of Shoal Creek. The head of Shoal Creek is about three miles from Cambridge (near the current Cambridge-Dorchester Airport) and a mile or so from the headwaters of the Little Blackwater River. 3. In a 1730 deposition, Andrew Willis, then about age 40, gave a sworn statement about the location of a boundary marker for a tract of land called “Littleworth” or “Stevens”. Littleworth frequently appears in the land records as having been adjacent Wantage. Andrew’s knowledge of the boundary would logically derive from having lived at Wantage as a youth. Thomas – Circumstantial evidence supports Thomas as the remaining unnamed child of John Willis Sr.
1. John Sharp sold a 50-acre tract of land on Marshy Creek Branch above Hunting Creek to John Willis Jr. on 10 March 1717. Less than five months later, Sharp sold an adjoining 50 acres to Thomas Wallis (Willis). Since families often moved as a group, a reasonable conclusion is that there was a relationship between John and Thomas, and that they were likely brothers. Of course, it is possible that the two were unrelated … the last name Wallis was an alternate spelling for the name Wallace as well as Willis. However, clerks frequently varied the spelling of the name Willis, sometimes within the same document. Those variants include Wallis, Wallace, Wallice, Willace, Willes and Willous. In fact, John Willis Sr. appears in early rent rolls as John “Wallis” in possession of “Wantige.” For purposes of this article, I assume this is Thomas Willis. If I am wrong, then we can state we have no information about him, however, since he seems to have had no children, it does not matter. 2. Grace Wallis (Willis) administered the estate of Thomas Willis in 1722-1724. The 1712 will proves a Grace Willis as a daughter of John Willis, and there is no record that she married. Furthermore, there is no record that Thomas Willis married, nor a record of any offspring. These two unmarried siblings possibly shared the same roof on Thomas’s land, and upon his death intestate Grace handled the estate. On the other hand, it is possible that administratrix Grace was Thomas’s wife. But, again with no offspring, it does not matter to this analysis. 3. As we will see later, Andrew Willis named sons with his first wife Andrew, William and Thomas. Presumably, he named one for himself and the others for two of his brothers. He named sons with his second wife Richard, George and John. In conclusion, the John Willis Family of Dorchester and Caroline Counties included sons John, Andrew, Thomas and William, and daughters Grace and Eliza. Assigning accurate dates of birth to the children is problematic. Andrew was born in about 1690. John Jr. was the eldest son and therefore born at least by 1689. A deposition given sometime between 1746 and 1752 establishes that William was born between 1694 and 1700. Grace was named before Eliza in the 1712 will, indicating she was likely the elder of the two. The relative ages of Thomas and William are also uncertain, but I suspect William was the youngest. It was not uncommon for the youngest son, the last to leave the household, to serve as a caregiver for aging or ill parents. Such service would put him in good graces with regard to inheritance. The same could be said of a daughter who remained in the household and unmarried. William Willis and his wife Judith apparently lived at Wantage until 1734, when they sold it to Richard Seward for six pounds. However, two weeks prior to that sale, eldest son John Willis sold the same land to Henry Ennalls for 20 shillings. The two sales are a puzzle that is not solved by the deed or probate records. By 1734, John Jr. lived many miles from Wantage in what later became Caroline County and had no apparent claim to his father’s former tract. However, John Jr.’s earlier will contest and the fact he was the eldest son may have created some cloud on the title in the eyes of Richard Seward, the prospective buyer. William Willis or Seward may have asked John to relinquish any claim to the land prior to Seward buying it. John could comply by conveying his interest, if any, in the land to William (or Seward), clearing title so his brother’s transaction could proceed. Such a transaction would account for the very low price paid in John’s deed. The 20 shillings paid to John likely compensated him for his time and travel between his home and Cambridge to complete the transaction. Thus ends the first installment of the John Willis Family of Dorchester and Caroline Counties, Maryland. In future articles, I hope to tell the story of the descendants of John Jr. and Andrew, some of whom played a significant role in the history of Preston, Maryland, and the surrounding area. W.P.W. Phillimore, editor, Berkshire Parish Registers, Marriages, Volume 1, (London:Phillimore & Co., 1908), I:17, John Willis and Annis Robinson, 31 Mar 1600; I:30, John Willis and Alice Lindsey, 19 Aug 1639; and I:41, John Willis, Junr [?] and Elizabeth Chapman, 11 Apr 1664. Peter Wilson Coldham, The Complete Book of Emigrants, 1661-1699, (Baltimore: Genealogical Publishing Co., Inc., 1990), II:471. Id. at 471, and Phillimore, Berkshire Registers, I:34, Leonard Willis and Margaret Powell, 8 Sep 1652; I:39, Leonard Willis and Anne Bell, 10 Sep 1659. Henry, born in 1663, fits as a son of either marriage. There is no proved connection between John Willis Sr. and Leonard and Henry of Wantage. Skinner, Testamentary Proceedings of the Prerogative Court, VII:61. Court Session 1694 – In the probate of the estate of William Pritchett, John Haslewood of Dorchester County exhibited the bond of Hannah Charlescroft, administratrix of William Pritchett. Securities Richard Owen, Jarvis Cutler. Also inventory by appraisers John Frank and John Willis. Probate Book 15C:125. Skinner, Testamentary Proceedings of the Prerogative Court, VIII:180. Court Session May 1700 – In the probate of the estate of Patrick Donelly, attorneys exhibited the inventory of Patrick Donelly by appraisers David Jenkins and John Willis, Probate Book 18A:62, and XI:4. Court Session Oct 1703 – In the probate of the estate of Daniell Seare of Dorchester County, attorneys exhibited Inventories of the estate of Daniell Seare by appraisers John Willis & William Walker. Probate Book 20:4. McAllister, Abstracts from the Land Records of Dorchester County, Maryland, Volume 9 (Liber Old No. 13: Liber Old No. 14, folios 1-373), (Cambridge, MD, 1963), IX:36. 14 Old 130, 14 Mar 1746 – Deposition of Thomas Pierson, planter of Dorchester County, aged about 60 years, states that John Willis now living in St. Mary’s White Chappel Parish near Hunting Creek was to the best of deponent’s knowledge the eldest son of John Willis who lived on Blackwater River about 4-5 miles from Cambridge, and who was formerly Cryer of Dorchester County Court. FHL Film No. 13078, Maryland Land Office, 194. On 10 Sep 1702, John Taylor assigned to John Willis all right, title and interest in 50 acres of land, part of a warrant for 2,389 acres granted Taylor on 15 Oct 1792, Book CD4/194, and Id. at 194. On 3 Mar 1702/3, the Maryland Land Office issued a survey certificate to John Willis for a tract of 50 acres called Wantage on the Blackwater River, beginning at lowermost bounder of Littleworth, then N 36 deg E 100 perches, N 36 deg W 80 perches, S 36 deg W 100 perches, then straight line to the beginning. Book CD4/194. Hunt, 1. John Willis is mentioned in the “Quit Rents” of 1704 as being a “planter,” on file in the Library of Congress and the London Public Record Office, and Keddie, Leslie and Neil, Dorchester County, Maryland, Rent Rolls 1688-1707 Volume #3, (The Family Tree Bookshop, 2001), 75. Wantige was surveyed for John Wallis on 3 Mar 1702, lying on the Blackwater River beginning at the lowermost bounded tree of “Littleworth.” It encompassed 50 acres and the rental was 8 shillings. Cotton and Henry, Calendar of Wills, IV:23. Note that the date given in this source for the submission to probate is 24 Nov 1714. This date conflicts with the date John Willis, Jr., filed a protest to the will and the dates of activity in the Perogative Court records. I conclude the correct date for submission to probate is 24 Nov 1712. Dorchester County Will Book 14:12.
 http://freepages.genealogy.rootsweb.ancestry.com/~mdwillis/DCWillsWillis.htm#John1712, Sandra Willis who abstracted numerous documents from primary records in Dorchester, Caroline and Talbot Counties created this site. V.L. Skinner, Jr., Testamentary Proceedings of the Prerogative Court, Volume XIII, 1712-1716, (Baltimore: Genealogical Publishing Company, 2008), 113, 124, 132, 153 and 157, Probate Book L22:256, 368, 378, 452 and 456. Jane Baldwin Cotton, The Maryland Calendar of Wills, IV:167-9. Will Book 14:631, Will of Thomas Ennals dated 7 May 1718 – To Thomas Hayward and heirs, 50 acres part of “Ennalls Purchase” (plantation where Andrew Willis lived), at head of Shoal Creek, and on branch lying between Wm Jones and Andrew Willis’, proved 13 Au 1718, and, James A. McAllister, Jr., Abstracts from the Land Records of Dorchester County, Maryland, Volume 1 (Libers Old No. 1 – Old No. 2), (Cambridge, MD, 1960), I:71. 2 Old 161, 13 Mar 1722 – Land sale from Thomas Hayward to Henry Ennalls, land devised to grantor by Col. Thomas Ennalls, dec’d, at head of Shoal Creek where Andrew Willis lived adj land where William Jones lived, part of “Ennalls Purchase”, 50 acres more or less. Skinner, Testamentary Proceedings of the Prerogative Court, XVI:60, 61 and 151. Filings by John Pitts, gentleman, of Dorchester County, bond of Grace Wallis, administratrix of Thomas Wallis, and inventories of the estate of Thomas Wallis, and Skinner, Administration Accounts of the Perogative Court, Libers 1-5, 1718-1724, (Westminster, MD:Family Line Publications, 1995), 138. L5:38, Account of Thomas Wallis of Dorchester dated 13 Mar 1723 – Account total £12.17.7, Payments totaled £18.5.2 made to Patrick Mackalister, Mr. Charles Ungle, John Sharp, John Pitt, Edward Billeter, William Edmondson. Administratrix Grace Willis. The land on Hunting Creek was located within St. Mary’s White Chapel Parish. Unfortunately, the church records for that locale that might prove the marital status of Thomas or Grace do not survive. James A. McAllister, Jr., Abstracts from the Land Records of Dorchester County, Maryland, Volume 10 (Liber Old No. 14, folios 374-741), (Cambridge, MD, 1963), X:74. 14 Old 658, 11 Nov 1746 to 27 May 1752, Commission to perpetuate the bounds of John Harrington’s land called “Rosses Range” and “David Ropies”, and Return. Nine men and women give depositions regarding this land on Hobson’s Creek. Among them are William Willis, age about 52; Judah (Judith) Willis, age about 50; and Mary Seward, age 68. I believe the date of John’s transaction to be 30 July 1734, not 1730. The extant deed book is a copy of the original. The recopied document states the date of the deed in words rather than numbers, “One thousand seven Hundred and thirty.” I believe the scribe who recopied it missed the last two words of the date, which under the style of the day should have been “and four”. If John intended his transaction just to clear title for to William’s sale, the following logically occurred. John showed up at the Dorchester County Court when it was in quarterly session. Henry Ennalls drafted a deed that John signed (by mark, like his father he could not read or write). The court justices, including Henry Ennall’s brother Bartholomew, witnessed the signing, and John acknowledged the deed in open court, verifying its validity. All this occurred on a single day, 30 Jul 1734, which limited the inconvenience to the citizen who traveled some distance from Hunting Creek to Cambridge. The payment in the deed was for time and expenses. Sixteen days later Richard Seward bought the land from William and Judith Willis with assurance that John would not be able to successfully protest the sale. James A. McAllister, Jr., Abstracts from the Land Records of Dorchester County, Maryland, Volume 11 (Liber Old No. 15, folios 1 – 368), (Cambridge, MD, 1963), XI:52, 15 Old 247, 11 Aug 1754-15 Mar 1755, Commission to perpetuate the bounds of Richard Soward’s land called Wantage. A deposition of Thomas Soward, about 30 years old, mentions the widow Brawhawn; John Stevens grandfather of the present John Stevens; Richard Soward, brother of the deponent; and a bounded tree of Littleworth and Wantage between Roger Woolford’s plantation and Brawhawn’s, about 15-16 years ago. We like to do genealogy trips to state archives, county courthouses, and so on. We drive rather than fly, and occasionally find ourselves off the beaten path or onto one that makes us scratch our heads. This happened once when we were traveling to Raleigh, NC from Houston, and we were on I-20 going through Atlanta. We had to stop for gas, so Gary pulled off the freeway onto MLK Blvd. He immediately found a gas station, and I got out to stretch my legs with a quick walk. 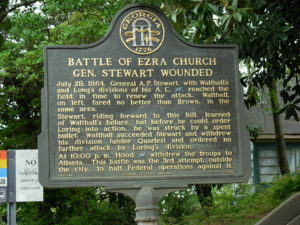 Heading up the hill, I found an historical marker about the Battle of Ezra Church — the one in the picture, above. What are the odds that we would wind up next to a battlefield where a relative fought and died, while getting gas in the middle of a huge metropolitan area? I thought it was quite a coincidence. On our way home two weeks later, we pulled off again on MLK Blvd and took a tour of the battlefield, which is in the midst of a neighborhood. It is not even far enough from Atlanta to be called a suburb. There is a park, with commemorative markers and the like. Here is one. Notice the marker says that probably not more than 12,000 Union troops were actively engaged in that battle. Yet there were 4,600 Confederate dead. What sort of military madness was going on there, we wondered? When we got home, we researched the battle and jointly wrote an article about the three Estes brothers who were in Ham’s Cavalry, including the one Estes brother who fought and died at the Battle of Ezra Church. If you like history, especially Civil War history, you might like this article. I like it because, among other things, I found out from their war records that the three Estes brothers in Ham’s Cavalry had black hair and a fair complexion, just like their great-great-great nephew, my father. Lyddal Bacon Estes, Sr. (“LBE”) and “Nancy” Ann Allen Winn, who married in Lunenburg County, Virginia on 10 March 1814, had five sons: (1) Benjamin Henderson Estes (“Henderson”), (2) John B. Estes, (3) Lyddal Bacon Estes, Jr. ( “LBE Jr.”), (4) William Estes, and (5) Allen W. Estes. At least three of the five sons – Henderson, LBE Jr. and Allen – fought for the Confederacy, and this article is about them. Henderson and LBE Jr. served during 1861-1862 in an infantry regiment involved in the unsuccessful defense of Fort Donelson, Tennessee. Beginning in 1863, the three Estes brothers all served as officers in Company A of Ham’s Cavalry. That unit was also known as the1st Battalion, Mississippi State Cavalry, and then as Ham’s Cavalry Regiment after it transferred from state to Confederate service. Company A was nicknamed the “Tishomingo Rangers” – suggesting that the unit was formed in Tishomingo County, Mississippi and that many members of the unit may have lived there, as did the Estes family. The three brothers’ military service records beginning in 1863 contain some interesting genealogical information for researchers on this Estes line, and also help to put a human face on what might otherwise be impersonal Civil War history. B. H. Estes appears as a 3rd Lieutenant and 2nd Lieutenant with Company D of the 3rd Mississippi Infantry Regiment, and then as a 3rd Lieutenant of the 23rd Infantry Regiment, Company D. The unit was originally raised as the 2nd Mississippi Infantry under Col. Davidson in August-September 1861 and sent to Kentucky, where it was known as the Third Regiment and, after November 1861, the Twenty-Third Regiment. The regiment was involved in the defense and surrender of Fort Donelson in February 1862, although some of the unit escaped. Captured members of the regiment were held at Springfield, Illinois, Indianapolis, Indiana and at Camp Douglas, Chicago, were a number died and are buried. Survivors were exchanged in the fall of 1862 and the regiment was reorganized and recruited replacements for the war. LBE Jr. apparently served in the same unit. He (or some L. B. Estes, presumably the same man) is reported as serving as a Lieutenant in Company G of the 2nd Mississippi Infantry Regiment. part of Davidson’s command which became renumbered as the 3rd and then the 23rd. Like his brother, we don’t know whether he was captured and exchanged, or escaped capture, at the surrender of the fort. In any event, both Henderson and LBE Jr. were available to serve in Ham’s Cavalry by March 1863. It is possible that, after the prisoner exchange of 1862, both returned to their homes in Tishomingo County. By that time, Tishimingo and other northern Mississippi counties were outside Confederate control and beyond the reach of conscription or forced service. However, local partisan companies or so-called “state troops” were organized in these regions and sometimes operated without Confederate oversight. Often such troops were part-time soldiers, living at or near home and tending to their farms. That seems to have been the case with Ham’s Cavalry as originally organized. After 1862, the Civil War file for Henderson (who is shown consistently in the file as “Captain B. H. Estes”) indicates that he enlisted twice: this was not unusual, because soldiers frequently enlisted for a limited term and then “re-upped” when the initial term had expired. In most Confederate records, the name of the officer who enlisted or re-enlisted the soldier is also stated in the file. What is unusual in Henderson’s case is that his file indicates that he enlisted himself for his first term of service. Stated another way, the file shows that Capt. B. H. Estes was the enlisting officer for Capt. B. H. Estes, suggesting that Henderson may have been the person who organized the Tishomingo Rangers. This is supported by the fact that he signed one of the muster rolls as company commander, since it was common for an organizer to be a company leader. Further, since he was in his late forties when the war broke out, Henderson would have been a logical candidate to organize a unit that was presumably composed primarily of younger men. He was also from a relatively prosperous family, which was a virtual prerequisite for organizing a unit: the organizer frequently, if not usually, helped outfit the unit he recruited. Henderson enlisted himself and his brothers LBE Jr. and Allen W. Estes in Kossuth on March 10, year unstated, for a term of 12 months. That enlistment must have occurred by at least March 1863, because Henderson appears on the Company A muster roll records for September 18, 1863 through April 30, 1864. A March 1863 enlistment would also be consistent with the dates of his earlier infantry service. The record indicates that Henderson enlisted for a second time on January 20, 1864 in Richmond, Virginia. No enlistment term is stated. Henderson was not actually in Richmond on that date, since Ham’s Regiment never participated in any battles in Virginia. It is likely that Richmond was given as the place of re-enlistment for administrative simplicity, since the troop was in the field at the time (and was possibly re-enlisted en masse). Shortly thereafter, on May 5, 1864, Ham’s Cavalry transferred from Mississippi state service to Confederate service. A descriptive list of Company A, Ham’s Cavalry Regiment, notes that Henderson was 5’7″, with blue eyes, black hair, and a fair complexion. He is described as a farmer, born in Virginia, age 48, which is consistent with the census records in which Henderson appears as a head of household. LBE Jr., a Second Lieutenant, also enlisted on May 10 for a term of twelve months, by enlisting officer Capt. B. H. Estes. The year was not stated but, like Henderson, it was probably 1863. LBE Jr.’s record states that he was mustered into Confederate service on May 5, 1864 by Capt. L. D. Sandidge for the duration of the war. His file, like Henderson’s, records his appearance on the muster roll of Company A from at least September 18, 1863 through April 30, 1864. LBE Jr.’s file also indicates that Company A was in Tupelo, Mississippi as of 15 December, 1863. Like his brother Henderson, LBE Jr. states that he was a farmer. He gave Tennessee as his place of birth and his age as 37. LBE Jr. was almost certainly born in McNairy County, Tennessee, because that is where LBE Sr. and family appeared in the 1830 federal census. LBE Jr. re-enlisted, along with Henderson, on January 20, 1864. He appears on the descriptive list as 5’6″, age 37, blue eyes, dark hair, and fair complexion. Allen’s service record states that his name appears on a register of officers and soldiers of the Confederate Army who were killed in battle or died of wounds or disease. The youngest of the three brothers, Allen was age 32 when he enlisted. He was the tallest, at 5’8″, and had the same black hair, blue eyes, and fair complexion as his elder brothers. He was also a farmer, and, like LBE Jr., born in Tennessee, presumably McNairy County. His file states that Allen had his own gun; his brothers probably did as well, although only Allen’s file mentions that matter. Each of the three also undoubtedly had his own horse, which was a requirement for a member of a cavalry unit. Like his brothers, Allen enlisted at Kossuth on March 10 (presumably 1863) for a period of 12 months. His rank at enlistment was Second Sergeant, and he appeared on the Company A muster rolls with that rank for July 8 through January 20, 1864, when the unit was transferred from state to Confederate service. On May 5, 1864, he appeared in his file for the first time as a Captain. Duration of his enlistment: “for the war,” although another record in his file indicates that Allen enlisted for a period of three years. The length of his enlistment was moot, however, because Allen died on July 29, 1864, in a hospital in Atlanta, Georgia. Allen left a widow Josephine (neé Jobe) and a son Joseph, born about 1862. Ham’s Cavalry was active in various conflicts in Mississippi, Tennessee and Alabama. The regiment participated with Gholson’s Brigade in three attacks on July 6 and 7, 1864, in an unsuccessful attempt to cut off the retreat of Union forces from Jackson toward Vicksburg, Mississippi. Additionally, the unit was almost certainly involved in the battle at Tupelo on the 14th and 15th of July, 1864. 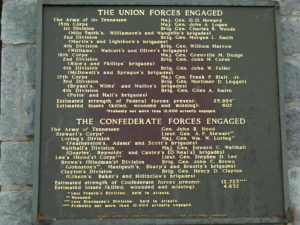 In that engagement, Confederate Generals Stephen D. Lee and Nathan Bedford Forrest, with about 8,000 troops, attacked Union General A. J. Smith’s federal force of about 14,000 in a series of uncoordinated and piecemeal assaults. The Confederates were defeated with heavy casualties. Battlefield maps clearly reveal the superior defensive position occupied by the Union forces on a ridge about one mile west of Tupelo. A battlefield map shows that Howard’s Union forces, located about three miles west of the Atlanta railroad depot, occupied a strong defensive position on a ridge line behind a rail barricade. Attacking in such circumstances was not only contrary to express orders, it was virtually suicidal. Estimated casualties: 562 U.S., 3,000 Confederate. A marker at the battlefield states that Brantly’s Brigade of Mississipians on the extreme left of the Confederate forces made it over the log barricades of the 83rd Indiana Regiment. However, they were swept back by a counterattack. Ham’s dismounted cavalry was probably part of this attack, and this (we speculate) may be where Captain Allan Estes fell. We do not, of course, want to honor the Confederate army, which was fighting to maintain slavery. We can nevertheless honor individuals who fought bravely for either side. Ironically, the family of Allen Estes, who died in that horrible war, did not own slaves. There is no indication in their individual military records as to when or where Henderson and LBE Jr. ended their Confederate service. However, LBE Jr.’s file expressly states that he enlisted for the duration of the war, suggesting that he was probably among those paroled at Selma. Given the history of the unit, it seems amazing that two of the three Estes brothers managed to survive. Both LBE Jr. and Henderson Estes returned to Tishomingo County after the war. Henderson appeared in the records there as a Justice of the Peace in the late 1860s By 1870, his mother Nancy had died, and he had moved his family to McLennan County, Texas. By 1880, LBE Jr. had joined Henderson and their sister, Martha Estes Swain, in McLennan County. LBE Jr. and his sister Martha are buried in the Fletcher Cemetery in Rosenthal, McLennan County; Henderson is buried at the Robinson Cemetery, also in McLennan County. © 2005 by Robin Rankin Willis & Gary Noble Willis. Nancy did not have four names, of course. She went by Nancy, which was most likely a nickname for Ann. She appeared in the records as Ann Allen Winn (Lunenburg Will Book 6: 204, FHL microfilm 32,381, will of her father Benjamin Winn, naming among his other children Ann Allen Winn), Nancy Allen Winn (Lunenburg Guardian Accounts 1798 – 1810 at 136, FHL microfilm 32,419, account naming Nancy Allen Winn and other orphans of Benjamin Winn), and Nancy A. Winn (numerous Tishomingo Co., MS records, e.g., Tishomingo probate Vol. C: 391, FHL Microfilm 895,897, bond for administrators of the estate of Lyddal B. Estes). We haven’t found any record of Civil War service for the other two sons, John B. Estes and William Estes. John left Tishomingo before 19 Aug 1853, when he and his wife Avy or Amy Ann Somers executed a deed from Nacogdoches Co., TX. Tishomingo DB Q: 305, FHL Microfilm 95,878. John appeared in the 1860 and 1870 U.S. census for Nacogdoches Co. but not thereafter. William Estes had already left Tishomingo by at least 18 Feb 1853, when he executed a general power of attorney in favor of Benjamin H. Estes. Tishomingo DB Q: 307, FHL Microfilm 895,878. The power of attorney recites that William was then a resident of San Francisco Co., CA. H. Grady Howell, For Dixie Land, I’ll Take My Stand (Madison, MS: Chickasaw Bayou Press, 1998) at 830-31. Unless expressly noted otherwise, the information in this article is from the National Archives & Records Administration’s military service records for B. H. Estes, L. B. Estes, and A. W. Estes. These Civil War files for the Estes brothers cover service from 1863, but not the earlier service referenced elsewhere. Howell at 830; www.mississippiscv.org/MS_Units/23rd_MS_INF.htm, which provides information from Dunbar Rowland’s Military History of Mississippi, 1803-1898. See www.mississippiscv.org/MS_Units/23rd_MS_INF.htm, information from Dunbar Rowland’s Military History of Mississippi, 1803-1898. Howell at 831. An L. B. Estes is also reported as having served as a non-commissioned officer (a corporal) in Company D of the 32nd Infantry Regiment. Based on the dates of formation of this unit and the 2nd Mississippi, it is likely these are two different people. Since Henderson Estes was in the same command, it is likely that Lt. LBE rather than Corporal LBE is the son of LBE Sr. and Nancy Estes. Central Texas Genealogical Society, Inc., McLennan County, Texas Cemetery Records, Volume 2 (Waco, Texas: 1965) at 154 (abstract of tombstone of Benjamin Estes in the Robinson Cemetery). He is listed in the 1840 census as “Henderson Estes,” see U.S. Census, Tishomingo Co., MS, p. 231. The NARA record indicates that the descriptive list is contained in an original record located in the office of the Director of Archives and History, Jackson, MS, M.S. 938010. 1860 U.S. census, Tishomingo Co., MS, Kossuth P.O., p. 91, dwelling 606, (Benj. H. Estes, age 43, farmer, b. VA); 1870 U.S. census, McLennan Co., TX, Waco, p. 157B, dwelling 755 (B. H. Estes, age 55, farmer, b. VA); 1880 U.S. Census, Brown Co., TX, Dist. 27, p. 443D (Benjamin Estes, 64, b. VA, parents b. VA). Central Texas Genealogical Society, Inc., McLennan County, Texas Cemetery Records, Volume 2 (Waco, Texas: 1965) (abstract of tombstone of Lyddal Bacon Estes in the Fletcher Cemetery, Rosenthal). See 1860 U.S. Census, Tishomingo Co., MS, Boneyard P.O., p. 87, dwelling 583 (listing for Nancy A. Estes and Allen Estes, age 27, thus born about 1833); service record of A. W. Estes (age 32 at enlistment in 1863, thus born about 1831). Irene Barnes, Marriages of Old Tishomingo County, Mississippi, Volumes I and II (Iuka, MS: 1978) (marriage of Josephine Jobe and W. A. Estes, Oct. 1859; marriage of Mrs. Josephine Estes and G. L. Leggett, August 1868). Grimmadge Leggett and wife Josephine appeared in the 1880 census, Alcorn Co. MS with his stepson “Jos. Ester” [sic]; see also 1900 census, Alcorn Co., MS.
 See http://www.decades.com/CivilWar/Battles/ms015.htm. Casualties estimated at 648 US, 1,300 CS. Atlas to Accompany the Official Records of the Union and Confederate Armies (Washington, DC: (Government Printing Office, 1891-1895, reprinted 1983 by Arno Press, Inc. and Crown Publishers , Inc. and in 2003 by Barnes & Noble Publishing, Inc.), at p. 167, Plate 63 – 2. See Atlas (note 14) at p. 153, Plate 56 – 7. General Lee also made serious military errors at Tupelo, committing understrength forces piecemeal against federal troops occupying a solid defensive position. He was obviously well-regarded, because he was the Confederacy’s youngest Lt. General and was the commander of the Department of Alabama, Mississippi and East Louisiana. See . Another source estimates casualties at 700 U.S. 4,642 CS. http://wwwhttp://college.hmco.com/history/readerscomp/civwar/html/. Howell at 213-214, listing Henderson Estes, Captain, and Toney Estes (LBE Jr.’s nickname), First Lieutenant, Company A, Eleventh Mississippi Cavalry (Ashcraft’s). Nancy does not appear in the 1870 census. An 1872 deed from Henderson to LBE Jr. recites that Nancy was deceased and that Henderson resided in McLennan Co., Texas. Tishomingo DB 2: 590, FHL microfilm 0,895,389. 1880 U.S. Census, McLennan Co., TX, p. 261 (listing for Lydal P. [sic] Estes and family). John M. Usry, Fall and Puckett Funeral Records (Waco, Texas: Central Texas Genealogical Society, 1974); McLennan County, Texas Cemetery Records, Volume 2.